Curved screens are not anything new – a statement that truly shows the innovation that we saw in 2012, with Samsung already demonstrating their curved screen capabilities. However, a recent application shows an Apple patent that suggests the Cupertino company are considering using flexible displays within a transparent body. This paper describes various embodiments that relate to an apparatus, method, and computer readable medium for creating a portable electronic device with a wraparound display. In one embodiment, a consumer electronic product is described. The consumer electronic product includes at least a transparent housing and a flexible display assembly enclosed within the transparent housing. In the described embodiment, the flexible display assembly is configured to present visual content at any portion of the transparent housing. 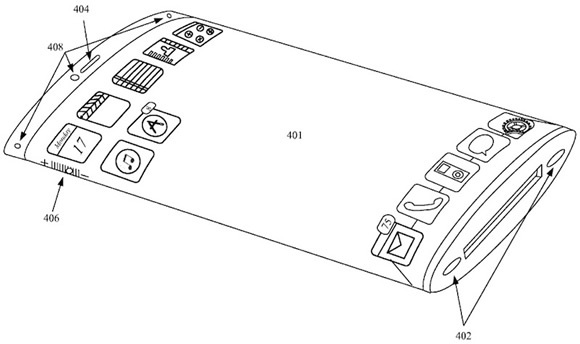 Making use of the flexible display, the Apple patent lists numerous options for such devices with transparent bodies in a number of different form factors, including the potential for containing a second inner display. The wrap around display fits into a transparent chassis by inserting, unfolding, or unrolling, wrapping around a majority or entirety of the device, allowing the most screen real-estate to be used. A flexible wrap-around display would allow the usual physical buttons we are used to seeing on modern devices, such as the volume rocker, home, and power buttons, replaced with touch counter-parts, offering a fully seamless touch experience. While we have seen flexible devices demonstrated by Samsung with the flexible tab on the phone dedicated to a notification ticker, it still feels like this technology is a long way off from coming to market. A real ‘purpose’ has yet to be found to make it really appeal to a consumer other than a novelty that would very quickly wear off, unless it increased efficiency in device operation. Let us know what you guys think about flexible displays in the comment section below.